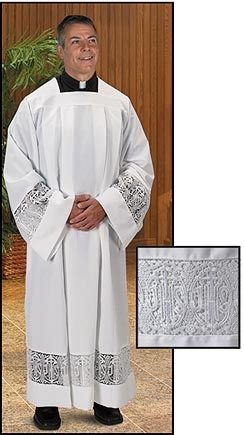 Our Augustinian Collection of lace insert surplices and albs is reminiscent of the Middle Ages when men and women of devout faith tailored church apparel by hand for the greater glory of God. Available with symbolic IHS Latin Cross and eyelet embroidery on beautiful box pleated or front-wrap albs. IHS is an ancient monogram formed from the first three letters - Iota, Eta and Sigma - of the Greek word for Jesus: IHSOUS. The letters also represent the phrase Iesous Hominum Salvator: Jesus, savior of man. Available in Small, Medium, Large or Extra Large. Specify size when ordering. See size chart for more details.